As the United States (US) experienced a sustained nursing shortage, health care policy makers and health care administrators, legislators, and researchers increasingly focused on minimum nurse staffing standards, cost of nursing care, and the relationship between nurse staffing and patient outcomes. A model for nurse staffing that encourages both cost efficiency and outcome effectiveness is elusive. One approach is to use a production function to examine the relationship between nurse staffing and patient outcomes. Production function relationships are used extensively in business to determine a range of resources needed to produce a quality product. There is a paucity of research investigating the impact of nurse staffing on patient outcomes in the rehabilitation setting. Therefore, the specific aim of this study was to apply production function theory to examine the nature of the relationship between nurse staffing and patient outcomes in the inpatient rehabilitation setting . Nurse staffing Registered Nurses (RNs), Non- RNs (Licensed Practical Nurses and Nursing Assistants), total nursing staff, and skill mix (RN Proportion and non-RNs) and its relationship with patient outcomes measured as length of stay (LOS) and functional independence (FIM) change was examined utilizing hierarchical linear modeling. This study was a secondary analysis of a parent study, Nurse Staffing and Patient Outcomes in Inpatient Rehabilitation Setting (Nelson, et. al, 2007). The hypothesis that there is a nonlinear relationship between RN HPPD and Non-RN HPPD with patient outcomes of LOS and FIM change is supported. Both HPPD estimates indicate that the relationships to LOS and FIM change direction. Therefore, the nature of the curvilinear relationship of nurse staffing and patient outcomes approximated a model of production function and diminishing returns. This study adds to the growing body of knowledge of nurse staffing and patient outcomes in the rehabilitation setting. This study provides further evidence that nurse staffing and patient outcomes have both a floor and a ceiling. These are both inflection points at which quality and efficiency are sacrificed. Further research is imperative to provide leaders in health care the ability to generate data-driven and evidence based practice decisions for optimal quality and efficiency. Thesis (Ph.D.)--University of Florida, 2014. 3 This document is dedicated to sagacious and pertinacious advocates for nurses and those entrusted to their care. 9 Abstract of Dissertation Presented to the Graduate School of the University of Florida in Partial Fulfillment of the Requirements for the Degree of Doctor of Philosophy NURSE STAFFING AND PATIENT OUTCOMES IN THE REHABILITATION SETTING: APPLICATION OF PRODUCTION FUNCTION THEORY By Mary Mar garet Nason May 2014 Chair: Donna Felber Neff Major: Nursing Sciences As the United States (US) experienced a sustained nursing shortage health care policy makers and health care administrators, legislators, and researchers increasingly focused on mi nimum nurse staffing standards, cost of nursing care, and the relationship between nurse staffing and patient outcomes. A model for nurse staffing that encourages both cost efficiency and outcome effectiveness is elusive. One approach is to use a producti on function to examine the relationship between nurse staffing and patient outcomes. Production function relationships are used extensively in business to determine a range of resources needed to produce a quality product. There is a paucity of research i nvestigating the impact of nurse staffing on patient outcomes in the rehabilitation setting. The refore the specific aim of this study was to apply production function theory to examine the nature of the relationship between nurse staffing and patient outc omes in the inpatient rehabilitation setting Nurse staffing [ Registered Nurses (RNs), Non RNs (Licensed Practical Nurses and Nursing Assistants), total nursing staff, and skill mix ( RN Proportion and non RNs) ] and its relationship with patient outcomes measured as length of was examined utilizing hierarchical linear modeling This study was a secondary analysis of a parent study Nurse Staffing and Patient Outcomes in Inpatient Rehabilitation Setting ( Nelson, et al 2007). 18 variables that affect the production process. Applicati on of production function as a statistical model is explicated in Chapter 3, Methods. While research in both nursing home and acute care settings demonstrated that increased levels of nursing staff have achieved improved outcomes; this approach has support ed the data do not assist health care administrators in determining standards that optimize both staffing and patient outcomes. This is further complicated by the influences of declining resources related to the nursing shortage, legislation, financial constraints, and profit incentives. As evidenced by the aforementioned research studies, nurse staffing levels and staffing skill mix are dynamics influenced by mult iple variables. Thus, managing care to achieve acceptable patient outcomes and safety is a challenge for nurse and health care administrators. identified relationship with improved patient outcomes. Limited studies have investigated the thresholds of staffing to achieve desired patient outcomes (Lang, Hodge, Olson, Romano, & Kravitz 2004; Lankshear, Sheldon, & Maynard 2005). Discerning if an ideal range of staffing leve ls and mix exists would support the reliability for staffing decisions to incorporate and influence patient outcomes. 21 index based on the OSCAR measures of the presence of indwelling catheters, pressure sores, physical restraints, and a calculated weight for incidence rate. Zhang and colleagues (2006) rec ognized that the most efficient production occurs within the region of decreasing marginal returns to labor. They hypothesized that the desired staffing point (unit of input) to be within the area of diminishing marginal returns in relationship to quality improvement and efficiency (outputs). They defined the ranges of quality improvement within the area at which quality is still improving and efficiency to be where returns to additional staffing are still positive. The minimum point of operation was deter und diminishing marginal returns to nursing labor in relationship to quality. Although production function theory was not specified, the results of subsequent studies have revealed a nonlinear relationship between nurse staffing and patient outcomes. Commi ssioned by the Centers for Medicare & Medicaid Services (CMS) under the Omnibus Budget and Reconciliation Act of 1990, Abt Associates, Inc. (2001) studied the appropriateness of establishing minimum nurse staffing standards in long term care. The report co ntends that RN, LPN, and NA staffing improves quality to a threshold where there is no further significant improvement. Zhang and Grabowski (2004) purported a nonlinear relationship between nursing s of staffing may have a strong influence (Zhang & Grabowski, p. 19). 22 Mark, Harless, McCue and Xu (2004), in their longitudinal study of 422 hospitals, conc unconditionally (p. 279) to the point of marginal return. Staffing increases in the lowest staffed 25% of hospitals showed the largest improvement in patient outcomes. Conversely, increases i n staff in the best 25% of hospitals (mean 8.9 hours per patient day) demonstrated marginal returns, and deterioration in some outcomes. With findings consistent with Zhang and Grabowski (2004), their study provides some of the most compelling evidence tha t a production function for nurse staffing and patient outcomes exists. An a priori assumption of Nelson and colleagues in their rehabilitation study was that a linear relationship existed between nurse staffing and patient outcomes (Nelson, et. al, 2007 ). However, their findings suggest a non linear relationship between nurse staffing and patient outcomes. Their findings were consistent with those studies conducted in long term care settings a production function relationship explained the diminishing returns of increased nurse staffing on patient outcomes (Hendrix & Foreman, 2001; Zhang, Unruh, Liu & Wan, 2006). Statistically and clinically significant associations between nurse staffing and patient outcomes were identified in the international system atic review by Lankshear, Sheldon & returns to increased RN level s and skill mix has more face validity than the linear relationship p. 172 ). Further, the systematic review and analysis of Kane and research team (2007) were consistent with identifying a curvilinear association between staffing and outcomes. 23 Pallas (2009) studied the effects of nurse staffing and work environment variables on patient outcomes in 24 Canadian cardiac and cardiovascular in patient units. The y sought to test the Patient C are Delivery Model a conceptual model which emphasizes th e multiple facto r s influencing patient outcomes They hypothesized that staffing levels and patient outcomes wer e nonlinear. The results demonstrate d that patient knowledge, status and behavior improved as staffing levels increased then changed direction with a pattern of diminishing marginal return. The recognition by researchers that a curvilinear relationship between nurse staffing and patient ou tcomes may exist has evolved over time. In addition, it has been demonstrated in a variety of health care settings. The application of production function theory becomes a logical progression of this area of health services research. Nurse Staffing Several early studies used large multi institutional databases to examine the effects of nurse staffing and mortality along with other characteristics. Three found that higher RN proportion was associated with lower mortality rates (Aiken, Smith, & Lake, 1 994; Hartz et al., 1989; Flood, Ewy, Scott, Forrest, & Brown, 1976). Three additional studies found no statistically significant relationships between nurse staffing and mortality (Al Hider & Wan, 1991; Shortell & Hughes, 1988; Shortell et al., 1994). The measures of nurse staffing and setting varied from study to study. In their later study, Shortell and colleagues (1994) utilized data directly from intensive care units. Unruh (2008), in her literature review of nurse staffing and patient, nurse, and fin ancial outcomes, noted improved research methodologies. Recent studies continue to support that lower nurse to patient ratios (higher RN staffing) were associated with lower mortality (Aiken, Clarke, Sloane, Lake, and Cheney, 2008; Aiken et al., 2010; Nee dleman et al., 2011). 30 patient day (direct RN and therapy staff) and functional gain in rehabilitation hospitals were small, less than 2% of variance. Similarly, Jette, Warren, and Wi rtalla (2004) reported positive associations with higher nursing staff level and therapy intensity and the average change in FIM in skilled nursing facilities. However, the staffing intensity variables contributed only 3% of the variance to the model. Var iations in the definitions of nurse staffing in the studies also confound the results. Clearly, these gaps call for current and future research related to nurse staffing and functional health outcomes. The study of nursing staffing and patient outcomes in acute and long term care has progressed exponentially over the past decade. Variables have become more refined. Systematic reviews have identified the concept of diminishing returns as nurse staffing and patient outcomes were examined. The application o f production function theory to the contributes to the gaps identified in previous studies. 31 CHAPTER 3 METHODOLOGY Purpose The specific aim of this study was to apply production function theory to examine the nature of the relationship between nurse staffing and patient outcomes in the inpatient rehabilitation setting. Nurse staffing [ Registered Nurses (RNs), Non RNs (Licensed P ractical Nurses and Nursing Assistants), total nursing staff, and skill mix ( RN Proportion and non RNs) ] and its relationship with patient outcomes measured as length of stay (LOS) and functional was examined. C hapter 3 disc usses the study design, application of the production function to the study, the empirical specification, the parent study (setting, subjects, sample, and data collection methods), operationalization of variables utilized in the secondary analysis, and dat a analysis methodologies. Hypothesis The following hypothesis was tested: There is a non linear relationship between nurse staffing levels for RNs, Non RNs, total nursing staff, and skill mix (RN proportion) with patient production function relationship is elucidated Design This study was a secondary analysis of data that was collected in the parent study entitled It was a collaborative research study between the Uniform Data Systems (UDS), the Association of Rehabilitation Nurses (ARN) and the Veterans Health Administra tion (VHA) for the purpose of examining nurse characteristics (experience and certification in rehabilitation), nurse staffing, and patient outcomes in the inpatient rehabilitation setting. 35 returns to staffing. Finally, increases in staffing wi ll result in a decrease in patient outcomes and negative marginal returns to staffing. The maximum level of nurse staffing is exemplified as L3 in Figure 3 1 because adding nurse staffing beyond this point would result in increased LOS and change. Empirical Specification The next step is to transform the general form of the production function: where Q (patient outcomes) = f [L (nurse staffing); X (covariates)] into the empirical specification to be used in the data analysis. The standard linear specification, which would be: Q = a + bL + cX, cannot be used here, because it would not allow the TP curve (patient outcome as a function of nurse staffing) to be S=shaped. To allow for that possibility, a curvilinear model was specified. Procedu re Methods Following dissertation committee approval, paperwork was processed to gain approval of the University of Florida Institutional Review Board (IRB 01). Exempt review was requested and approved, as subjects were fully de identified in the data set provided to the recipient investigators and in compliance with the Health Information and Portability and Accountability Act of 1996. A confidentiality agreement with the primary investigator of the original study was obtained and submitted assuring that t he recipient investigators will not be provided access to the identities of the subjects or to information through which the identities of subjects could be readily ascertained. Included in the packet were copies of the approval letters for the parent stud y from the Tampa Veterans Administration (VA) Medical Center IRB and the Un iversity of South Florida IRB. 36 Data The data for this study come from research conducted by Nelson, et al. (2007). That study randomly selected a sample of 54 rehabilitation units f rom a pool of 806 rehabilitation units in the United States participating in Uniform Data System for Medical Rehabilitation (UDSMR), stratified by the USDMR geographical regions. Patient level data were extracted from the USMR database for a one month p eriod and were de identified prior to transmission to investigators at the coordinating site, the Tampa Veterans Administration (VA) Medical Center. Nurse level variables were collected via surveys and logs for a one month period. Data collection occurred over a 24 month period in 2005, staggered by site and reported as unit aggregated data. Variables Study variables and operational definitions are presented in Table 3.3. The predictor variables are nurse staffing and the dependent variables are patient outcomes. The facility staffing variables were further delineated as staffing levels of Registered Nurse hours per patient day (RN HPPD, Non A), total staffing (THPPD), and skill mix (PROP RN). Patient outcomes are measured in two ways in this Association of Rehabilitation Nurses ( 2004, 2005 ) describes the h igh priority research issues in their second edition of the Rehabilitatio n Nursing Research Agenda Under one of the categories, outcomes in relation to the type, intensity, and duration of rehabilitation nursing services required as a high priority agenda item. This agenda item supports the selection of both length of Study variab les, data sources, values, and measures are reflected in Table 3 4. 48 CHAPTER 4 RESULTS Purpose The specific aim of this study was to apply production function theory to examine the nature of the relationship between nurse staffing and patient outcomes in the inpatient rehabilitation setting Nurse staffing [ Registered Nurses (RNs), Non RNs (Licensed P ractical Nurses and Nursing Assistants), total nursing staff, and skill mix ( RN Proportion and non RNs) ] and its relationship with patient outcomes measured as length of stay (LOS) and functional was examined C hapter 4 presents the sample descriptives and results of the hierarchical linear models. Description of Sample The descriptive statistics for the nurse staffing characteristics, patient outcomes, patient characteristics, and facility characteristics are presented i n table 4 1. Nurse Staffing Characteristics The total nursing care hours per patient day averaged 6.9 ( SD =3.5) with a range of 0.7 21.4. The average RN HPPD were 3.6 ( SD =2.2) and Non RN HPPD were 3.3 ( SD =1.9). The proportion of RNs was 50% ( SD =0.1). Patient Outcomes Length of s tay A total of 1529 patients had their full length of stay, admission to discharge, during the data collection period. The average LOS was 9.7 days ( SD = 5.1). 49 c hange SD = 16. 7). The average d ischarge SD change SD = 13.3). Patient Characteristics The average patient age was 69.7 ( SD 15.3), with a range from 5 to 101 years. Just over half (57.10%) of the patients were female. The patients were predominantly white (85.22%) ere married (49.17%). Lower extremity joint replaceme nt (i.e. knee replacement) represented the majority of patients : 25.87% Next s troke accounted for 18.14% of the patients The miscellaneous RIC oup (fractured lower extremity, arthritis) was 17.03%. The remainder of the RIC groups, brain injury, spinal cord injury, neurological and amputation accounted for less than 7% of the patients each Facility Characteristics There were 54 rehabilitation facilities included in the study. Of those, 49 (90.74%) were identified as rehabilitation units within acute care facilities. Only 5 facilities (9.26%) were identified as free standing rehabilitation hospitals. The mean number of operational beds was 28 .1 ( SD =17.5). Because of the difference in the nature of the facilities (units within hospitals versus free standing rehabilitation hospitals), the range of operational beds was broad: 8.0 82.0. 57 CHAPTER 5 DISCUSSION AND IMPLICATIONS Purpose The specific aim of this study was to apply production function theory to examine the nature of the relationship between nurse staffing and patient outcomes in the inpatient rehabilitation setting Nurse staffing [ Registered Nurses (RNs), Non RNs (Licensed Practical Nurses and Nursing Assista nts), total nursing staff, and skill mix ( RN Proportion and non RNs) ] and its relationship with patient outcomes measured as length of stay (LOS) and functional was examined. Chapter 5 presents the discussion of the results, limitations, and conclusions of this study and implications for future utilization and research. Discussion The following hypothesis was tested: There is a non linear relationship between nurse staffing levels for RNs, Non RNs, total nursing staff, and skill mix (RN proportion) with patient setting such that a production function relationship is elucidated Production Function The hypothesis that there is a nonlinear relationship between RN HPPD and Non RN HPPD with patient outcomes of LOS and is supported. The relationship s of RN HPPD and Non RN HPPD with LOS and are such that neither the linear or quadratic terms are significant However, both HPPD estimates indicate that the direction of the relationships to LOS and FIM change as evidenced by the reverse coefficient for the squared terms This is consistent with published literature indicating that a nonlinear relationship between nurse staffing and patient outcomes exists (Lankshear, Sheldon &Maynard, 2005; Kane et al., 2007; Nelson et al., 2007; Zhang & Grabowski, 200 4). 65 This study provides furth er evidence that nurse staffing and patient outcomes have both a sacrificed. Concerns about the economy and the state of health care in general have reached a Z eitgeist in the United States. Further research is imperative to provide leaders in health care the ability to generate data driven and evidence based practice decisions for optimal quality and efficiency. 66 REFERENCES Abt Associates, Inc. (2001). Approp riateness of minimum staffing ratios in nursing homes Report to Congress: Phase II Final. Cambridge, MA. Aiken, L. H., Clarke, S. P., Sloane, D. M., Lake, E. T., & Cheney, T. (2008). Effects of hospital care environment on patient mortality and nurse outco mes. Journal of Nursing Administration, 38 (5), 223 229. Aiken, L. H., Clarke, S. P., Sloane, D. M., Scholski, J., & Silber, J. H. (2002). Hospital nurse staffing and patient mortality, nurse burnout, and job dissatisfaction. Journal of the American Medica l Association, 228 (16), 1987 1993. Aiken, L. H., Sloane, D. M., Cimiotti, J. P., Clarke, S. P., Flynn, L., Seago, J. A., Smith, H. L. (2010). Implications of the California nurses staffing mandate for other states. Health Services Research, 1 18. doi:10.1 111/j.1475 6773.2010.01114.x Aiken, L. H., Smith, H. L., & Lake, E. T. (1994). Lower Medicare mortality among a set of hospitals known for good nursing care. Medical Care, 32, 771 787. Al Hider, A. S., & Wan, T. T. (1991). Modeling organizational determinants of hospital mortality. Health Services Research, 26 (3 ), 305 323. Amaravadi, R. K., Dimick, J. B., Pronovost, P. J., & Lipsett, P. A. (2000). ICU nurse to patient ratio is associated with complications and resource use after esophagectomy. Intensive Care Medicine, 26, 1857 1862. American Nurses Association. (1997). Implementing nursing's report card: a study of RN staffing, length of stay and patient outcomes Washington, D. C.: American Nurses Publishing. American Nurses Association. (2002). Nursing's agenda for the future: a call to the nation Retrieved December 2, 2002, from http://www.nursingworld.org/naf ARN's strategic plan. ARN Network, 20 (3), 3. Association of Rehabilitation Nurses. (2005). The Rehabilitation Nursing Research Agenda Retrieved March 22, 2010, from http://www.rehabnurse.org/ Atalay, A., Turhan, N. (2009). Determinants of length of stay in stroke pati ents: a geriatric rehabilitation unit experience. International Journal of Rehabilitation Research, 32 (1), 48 52. Barkell, N. P., Killinger, K. A., & Schultz, S. D. (2002). The relationship between nurse staffing models and patient outcomes: A descriptive study. Outcomes Management, 6, 27 33. 67 Bazzoli, G.J., Chan, B., Shortell, S. M. hospitals belonging to health networks and systems. Inquiry, 37 (3), 234 52. Bostick, J. E., Rantz, M. J., Flesner, M. K., & Riggs, C. K. (2006). Systematic review of studies of staffing and quality in nursing homes. Journal of the American Medical Directors Association, 7, 366 376. doi: 10.1016/j.jamda.2006.01.024. Centers for Medicare and Medicaid Services. (2012). Inpatient Rehabilitation Facility PPS Retrieved from http://www.cms.gov/InpatientRehabFacPPS/ Cho, S. H., Ketefian, S ., Barkauskas, V. H., & Smith, D. G. (2003). The effects of nurse staffing on adverse events, morbidity, mortality, and medical costs. Nursing Research, 52, 71 79. Coffman, J. M., Seago, J. A., & Spetz, J. (2002). Minimum nurse to patient ratios in acute care hospitals in California. Health Affairs, 21 (5), 53 64. Committee on t he Robert Wood Johnson Foundation Initiative on the Future of Nursing, At the Institute Of Medicine (2010). The future of nursing: Leading change, advancing health: Report recommendations Washington, DC: National Academy of Sciences. Dall, T. M., Chen, Y. J., Seifert, R. F., Maddox, P. J., & Hogan, P. F. (2009). The economic value of professional nursing. Medical Care, 47 (1), 97 104. Dodds, T. A., Martin, D. P., & Stolov, W. C., et al (1993). A validation of the Functional Independe nce Measure and its performance among rehabilitation inpatients. Archives of Physical Medicine Rehabilitation, 74, 531 536. Duchene, P. M. (2008). Quality: indicators and management. In S. P. Hoeman (E d.), Rehabilitation Nursing: prevention, intervention, and outcomes (4th ed., pp. 146 160). St. Louis, MI: Mosby. Eastwood, E. A., Hagglund, K. J., Gordon, W. A., & Marino, R. J. (1999). Medical rehabilitation length of stay and outcomes for persons with traumatic spinal cord injury 1990 1997. Archives of Physical Medical Rehabilitation, 80, 1457 63. Estabrooks, C., A., Midodzi, W., K., Cummings, G., G., Ricker, K., L., Giovannetti, P. (2005). The impact of hospital nursing characteristic on 30 day mort ality. Nursing Research, 54 (2), 74 84. Flood, A. B., Ewy, W., Scott, W. R., Forrest, W. H., Brown, B. W. (1979). The relationship between intensity and duration of medical services and outcomes for hospitalized patients. Medical Care 17 (11), 1088 102. Flood, S., & Diers, D. (1988). Nurses staffing, patient outcome, and cost. Nursing Management, 19, 34 43. 68 Garber, A. F. (1984). Case mix, costs, and outcomes: differences between faculty and community services in a university hospital. New England Journal of Medicine, 5, 107 127. Granger, C. V., Markello, S. J., Graham, J. E., Deutsch, A., Reistetter, T. A., & Ottenbacher, K. J. (2010). The Uniform Data System for Medical Rehabilitation: Re port of patients with traumatic brain injury discharged from rehabilitation programs in 2000 2007. American Journal of Physical Medicine & Rehabilitation, 89, 265 278. doi : 0894 9115/10/8904 0265/0 Granneman, T., Brown, R., & Pauly, M. (1986). Estimating hospital costs: a multiple output analysis. Journal of Health Economics, 5, 107 127. Hall, L., Doran, D., Baker, G. R., Pink, G. H., Sidani, S., O'Brien Pallis, L., Don ner, G. J. (2003). Nurse staffing models as predictors of patient outcomes. Medical Care, 41 (9), 1096 109. Harada, N., Kominski, G., & Sofaer, S. (1993). Development of a resource based classification scheme for rehabilitation. Inquiry, 30, 54 63. Hartz, A. J., Krakauer, H ., Kuhn, E. M., Young, M., Jacobsen, S. J., Gay, G.,...Rimm, A. A. (1989). Hospital characteristics and mortality rates. New England Journal of Medicine, 321, 1720 1725. Heinemann, A. W., Linacre, J. M., Wright, B. D., Hamilton, B. B., & Granger, C. V. (1 994). Prediction of rehabilitation outcomes with disability measures. Archives of Physical Medicine and Rehabilitation, 75, 133 43. Heinz, D. (2004). Hospital nurse staffing and patient outcomes: a review of current literature. Dimensions of Critical Care Nursing, 23 (1), 44 50. Hendrix, T. J., & Foreman, S. E. (2001). Optimal long term care n urse staffing levels. Nursing Economics, 19 (4), 164 175. Hofmann, D. A., Griffin, M. A., & Gavin, M. B. (2000). The application of hierarchical liner modeling to organizational research. In K. Klein & S. Kozlowski (Eds. ), Multilevel theory, research, and methods in organizations: foundations, extensions and new directions (pp. 467 510). San Fra ncisco, CA: Jossey Bass. Hosek, S., Kane, R., Carney, M., Hartman, J., Reboussin, D., & Serrato, C. (1986). Charges and Outcomes for Rehabilitation Care. Implications for the Prospective Payment System. (R 3424 HCFA.) Santa Monica, CA: The RAND Corpora tion. Institute of Medicine (1999). To err is human: building a safer health system Washington, DC: National Academ ies Press. Institute of Medicine (2004). Keeping patients safe: transforming the work of nurses Washington, DC: National Academ ies Press. 69 Institute of Medicine (2010 ). The future of nursing: leading change, advancing health. Washington, DC: National Academ ies Press. Jette, D. U., Warren, R. L., & Wirtalla, C. (2004). Rehabilitation in skilled nursing facilities: Effect of nursing staff level and thera py intensity on outcomes. American Journal of Physical Medicine & Rehabilitation, 83, 704 712. doi:10.1097/01.PHM.0000137312.06545.DO Johnston, M. V., Wood, K. D., & Fiedler, R. (2003). Characteristics of effective and efficient rehabilitation programs. Archives of Physical Medicine and Rehabilitation, 84, 410 8. doi:10.1053/apmr.2003.50009 Kane, R. L., Shamliyan, T. A., Mueller, C., Duval, S., & Wilt, T J. (2007). The association of Registered Nurse staffing levels and patient outcomes: systematic review and meta analysis. Medical Care, 45 (12), 1195 1204. Kelly Ha yes, M., & Phipps, M. A. (2008). Evaluation of function and application of outcome measures. In S. P. Hoeman (Ed. ), Rehabilitation nursing: prevention, intervention, and outcomes (4th ed., pp. 168 177). St. Louis, MI: Mosby. Kennedy, R. E., Livingston, L. Marwitz, J. H., Gueck, S., Kreutzer, J. S., & Sander, A. M. (2006). Complicated mild traumatic brain injury on the inpatient rehabilitation unit: a multicenter analysis. Journal of Head Trauma Rehabilitation, 21 (3), 260 71. Kneipp, S. M. & Yarandi, H. N. (2002). Complex sampling designs and statistical issues in secondary analysis. Western Journal of Nursing Research, 24, 552 566. Lang, T. A., Hodge, M., Olsen, V., R omano, P. S., & Kravitz, R. L. (2004). A systematic review on the effects of nurse staffing on patient, nurse employee, and hospital outcomes. JONA's Healthcare Law, Ethics, and Regulation, 7 (8), 326 337. Lankshear, A. J., Sheldon, T. A., & Maynard, A. (2 005). Nurse staffing and healthcare outcomes: a systematic review of the international evidence. Advances in Nursing Science, 28 (2), 163 174. Lassnigg, A., Hiesmayr, M. J., Bauer, P., & Haisjackl, M. (2002). Effect of centre patient and procedure related factors on intensive care resource utilization after cardiac surgery. Intensive Care Medicine, 28, 1453 1461. Magee, T., Lee, S. M., Giuliano, K. K., & Munro, B. (2006). Generating new knowledge from existing data: the use of large data sets for nursing r esearch. Nursing Research, 55 (2), S50 S56. Mark, B. A., Harless, D. W., McCue, M., & Xu, Y. (2004). A longitudinal examination of ho spital registered nurse staffing and quality of care. Health Services Research, 39 (2), 297 301. 70 McClure, J. A., Salter, K., Meyer, M., Foley, N., Kruger, H., & Teasell, R. (2011). Predicting length of stay in patients admitted to stroke rehabilitation wit h high levels of functional independence. Disability and Rehabilitation, 33 (23 24), 2356 2361. doi:10.3109/09638288.2011.572225 McGillis Hall, L., Doran, D., & Pink, G. H. (2004). Nurse staffing models, nursing hours, and patient safety outcomes. Journal of Nursing Administration, 34, 41 45. McCoach, D. B. (2010) Hierarchical Linear Modeling. In G. R. Hancock &R. O. Mueller (Eds. ), (pp 123 140). New York: Routledge. Meyer, R.M., Wang, P., LI, X., Thompson, D., Obrien Pallas, L. (2009). 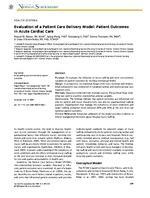 Evaluation of a patient care delivery model: patient outcomes in acute care. Journal of Nursing Scholarship, 41 (4), 399 410. doi: 10.1111/j1547 5069.2009.01308.x Needleman, J., Buerhaus, P., Mattke, S., Stewart, M., & Zelevinsky, K. (2002). Nurse staffing levels and the quality of care in hospitals. New England Journal of Medicine, 346, 1715 1722. Needleman, J., Buerhaus, P., Pankratz, V. S., Leibson, C. L., Stevens, S. R., & Harris, M. (2011). Nurse staffing and inpatient m ortality. New England Journal of Medicine, 364 (11), 1037 1045. Nelson, A., Powell Cope, G., Palacios, P., Luther, S. L., Black, T., Hillman, T.,...Gross, J. C. (2007). Nurse staffing and patient outcomes in inpatient rehabilitation settings. Rehabilitatio n Nursing, 32 (5), 179 202. Newbold, D. (2008). The production economics of nursing: a discussion paper. International Journal of Nursing Studies, 45, 120 128. Nicholson, W. (1978). Production Function. In Microeconomic theory: basic principles and extensions (2nd ed., pp. 139 140). Hinsdale, IL: Driden Press. Nicholson, W. (1995). Microeconomic theory: basic principles and extensions New York: The Dryden Press. Nicholson, W., & Snyder, C. (2008). Production Functions. In Microeconomic theory: basic principles and extension s (pp. 295 322). Mason, OH: Thompson South Western. Pearson, A., Pallas, L. O., Thompson, D., Doucette, E., Tucker, D., Wiechula, R.,...Jordan, Z. (2006). Systematic review of evidence on the impact of nursing workload and staffing on establishing healthy work environments. International Journal of Evidence Based Healthcare, 4, 337 384. doi:10.1111/j.1479 6988.2006.00055.x Polit, D. F., & Beck, C. T. (2006). Essentials of nursing research: methods, appraisal, and utilization (6th ed.). Philadelphia, PA: Lippincott, Williams & Wilkins. 71 Raudenbush, S. W., Bryk, A. S. (2002). Hierarchical liner models: applications and data analysis methods (2 nd ed.) London: Sage. San Segundo, R. M., Aguilar, J. J., Santos, F., & Usabiaga, T. (2007). A model for predicting delay in discharge of stroke patients. Annales de Read aptation et de Medecine Physique, 50 (1), 14 9. Schultz, M. A., Van Servellen, G., Chang, B. L., McNeese Smith, D., & Waxenberg, E. (1998). The relationship of hospital structural and financial characteristics to mortality and length of stay in acute myoca rdial infarction patients. Outcome Management Nurse Practice, 2, 130 136. Shepard, R. W. (1970). Theory of cost and production functions Princeton: Princeton University Press. Shindul Rothschild, J., Berry, D., & Long Middleton, E. (1996). Where have all the nurses gone? Final results of our patient care survey. American Journal of Nursing, 96 (11), 24 39. Shortell, S. M., & Hughes, E. E. (1988). The effects of regulation, competition and ownership on mortality rates among hospital inpatients. The New England Journal of Medicine, 318, 1100 1107. Shortell, S. M., Zimmerman, J. E., Rousseau, D. M., Gillies, R. R., Wagner, D. P., & Draper, E. A., Knaus, W. A. & Duffy, J. (1994). The perf ormance of intensive care units: does good management make a difference? Medical Care, 32 (5) 508 52. Smaldone, A. M., & Connor, J. A. (2003). The use of large adminis trative data sets in nursing Spetz, J., Donaldson, N., Aydin, C., & Brown, D. (2008). How many nurses per patient? Measurements of nurse staffing in health services research. Health Services Research, 45 (5), 1674 1690. Stineman, M. G. (1995). Case Mix measurement in medical rehabilitation. Archives of Physical Medicine and Rehabilitation, 76, 1163 70. doi:0003 9993/95/7612 3416$3.00/0 Stineman, M. G., & Williams, S. V. (1990). Predicting inpatient rehabilitation length of stay. Archives of Physical Medicine and Rehabilitation, 71, 881 7. Thungjaroenkkul, P., Cummings, G. G., & Embleton, A. (2007). The impact of nurse staffing on hospital costs and patient length of stay: a systematic review. Nursing Economics, 25 (5), 255 265. Tourangeau, A. E. Giovanetti P., Tu, J. V., & Wood, M. ( 2002 ). Nursing related determinants of 30 day mortality for hospitalized patients. Canadian Journal of Nursing Research, 33 (4), 71 88. 72 U. S. Department Of Health And Human Services (2001). Nursing workforce recruitment and es is a growing concern Washington, D.C: U.S. General Accounting Office testimony before the Committee on Health, Education, Labor and Pensions, U. S. Senate, May 17, 2001. Unruh, L. (2003). Licensed nurse staffing and adverse events in hospitals. Medi cal Care, 41 (1), 142 152. Unruh, L. (2008). Nurse staffing and patient, nurse and financial outcomes. American Journal of Nursing, 108 (1), 62 71. Unruh, L. Y., & Zhang, N. J. (2012). Nurse staffing and patient safety in hospitals. Nursing Research, 61 (1), 3 12. doi: 10.1097/NNR.0b013e3182358968 Yeung, S. M., Davis, A. M., & Soric, R. (2010). Factors influencing inpa tient rehabilitation length of stay following revision hip replacements: a retrospective study. BMC Musculoskeletal Disorders, 11, 252. Zhang, N. J., Unruh, L., Liu, R. & Wan, T. T. (2006). Minimum nurse staffing ratios for nursing homes. Nursing Economics, 24 (2), 78 85. Zhang, X., & Grabowski, D. (2004). Nursing home staffin g and quality under the Nursing Home Reform Act. The Gerontologist, 44 (1), 13 23. 73 BIOGRAPHICAL SKETCH Mary Margaret Nason graduated from the University of Alabama, Huntsville with her Bachelor of Science in Nursing, with high honors in 1979. Upon graduation, she served as an officer in the United State s Naval Nurse Corps until 1984. She received her Master of Science in Nursing from the University of Florida in 2001. She received her Ph.D from the University of Florida in the spring of 2014. Her minor course of study for her doctorate was Health Services Research, Management, and Policy. During her Ph.D. program she earned a research grant from Sigma Theta Tau, Lambda Rho Chapter at larg e. Her nursing e xperience includes a broad range of progressive clinical, administrative, research, educational, and informatics roles She has served as a member University of Florida Institutional Review Board (2006 2008 ) Her research interests are n urs ing workforce, patient outcomes and exploration of organizational effectiveness.